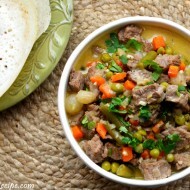 I came across a slow cooker recipe of Coconut-Curry Beef here, that looked delicious and I really wanted to try it. But since I don’t own a crock-pot, I coverted it into a non-slow cooker recipe, like my Honey Seasame Chicken recipe I did earlier and gave it a go in my trusty pressure cooker. Now, you don’t need a pressure cooker for this recipe, but if you have one and know how to use it properly it cuts the cooking time drastically and makes the meat so tender, it just falls apart. 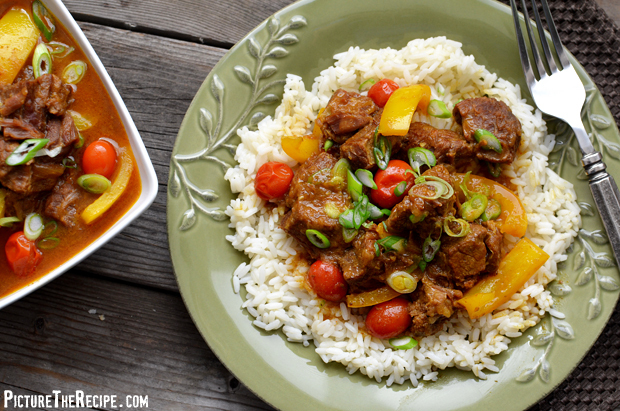 If you don’t have a pressure cooker, simply cook the curry in a dutch oven or big pot either on the stove or in the oven. 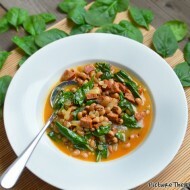 The cook time of this recipe may be a long but the prep work and recipe are super simple. The long cook-time is basically cos you want the meat very soft and tender enough to cut with a fork. This recipe re-heats very well, infact it develops more flavor the next day like stews do, so it makes for a great make-ahead party dish. 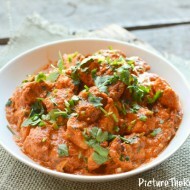 If you’re a fan of curry, this dish is definitely for you. 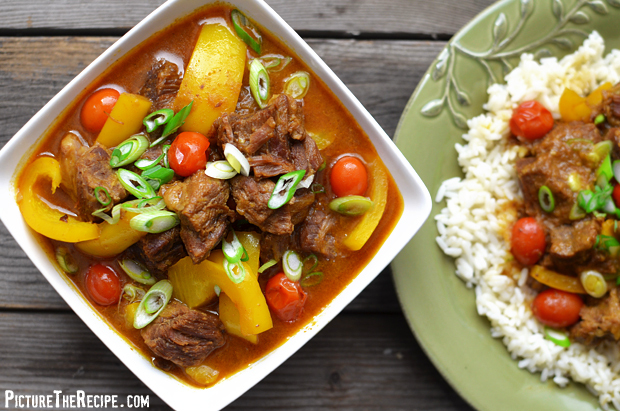 A delicious Asian-inspired beef in a coconut curry sauce with cherry tomatoes and peppers. Perfect over rice and garnished with green onion. – Chop the large onion in big dice pieces. Mince the garlic cloves and grate the ginger. – Season the beef pieces generously with salt. – In a large pot (I used a pressure cooker) heat the oil over medium-high heat. Then brown the beef pieces on all sides, in small batches to seal the meat and give it some color.Remove from the pot and set the browned beef aside on a plate, covered. – Toss in the onions and saute them for about 5 minutes until slightly translucent. – Reduce the heat to medium, then add the garlic, ginger,curry powder and cayenne pepper and stir all the spices together with the onion. Let it cook for about 2-3 minutes. 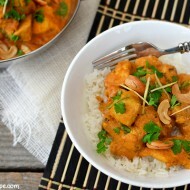 – Pour in the coconut milk and add the brown sugar, soy sauce & fish sauce to the pot and stir everything well. Taste and season with salt if necessary. – Add the browned beef back to pan, stir to combine all together well. – Lower the heat to a slow simmer. You can cover and cook the dish stove top for about 2-2 1/2 hours or slow cook it in an ovenproof dish covered at 275°F for at least 3 hours (4-5 hours is even better). Another option is a quick 30 minutes in a pressure cooker (like I did) till the meat is perfectly tender and falling apart. 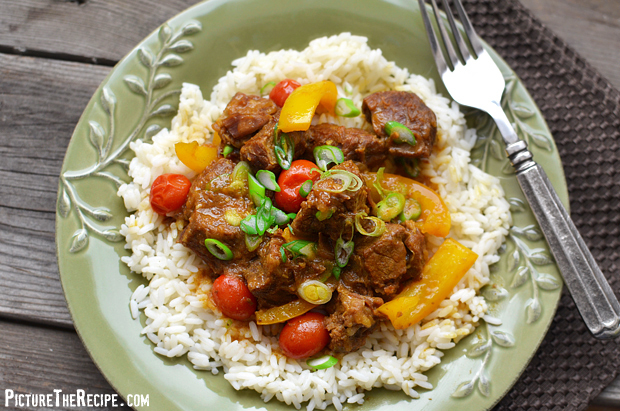 – Once the beef is fork tender, add the bell peppers and tomatoes and cook for an additional 15 minutes. – Serve over rice and garnish with sliced green onions.